The hugely popular Pop-up product has been trusted by the construction trade for many years. It allows workers to always be standing at the perfect working height, increases work rate, reduces fatigue and helps contractors to achieve an early finish on site. The standard pop up allow you to reach to 3.6m. It comes in one piece, the charger etc are all in the machine. This means that you will never be charged for missing parts. The pop-up battery holds a full days charge so that you don’t get any downtime on site. Hiring a pop up has been shown to increase the work rate due to reduction of fatigue in staff and the equipment providing the optimum working height for the completion of work. In a competitive industry, construction workers need to increase their work rate and reduce fatigue while maintaining safety working at height if they want to stay ahead of the game. Pop-Up scissor lift hire takes the strain out of working at height by allowing workers to stand in the perfect position for the job in hand. These low level powered access lifts are an easy alternative to ladders and steps, saving time and energy on site. The Pop-Up hydraulic platform lift is specially designed to be used indoors and to fit into tight spaces. It is even small enough to go through single doors. Using a Pop-Up has shown to increase the work rate due to reduction of fatigue in contractors and the equipment offers the optimum working height for the completion of work. 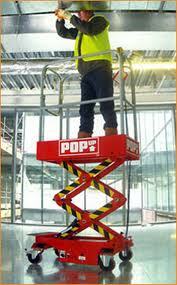 Scissor lift access platforms are ideal for gaining high up access and maneuverability even at full working height. With controls that are easy to master, the Pop-Up scissor lift maybe small but it holds a mighty load. It reaches a maximum working height of 3.6 metres in eight seconds and it take just one person to operate it. Described by trade experts as ‘a ready-made solution for building and construction firms’, Pop-Up can be used when installing pipe work, air conditioning, insulation, fire and security systems. Hiring a Pop-Up scissor lift can offer a real alternative to the smaller contractor. Buying the equipment can be an expensive business but the Pop-Up can be hired without having to worry about maintenance costs.